Adults frequently wonder what is so "Tomorrow" about driving a car around a concrete course, but the key is to remember that for children, driving a car is always in the future. Down to just the one version of Autopia from the original three (there used to be Fantasyland and Midget versions), four lanes of traffic wind through the area behind the submarines lagoon, going over different surfaces and with various sights to see. Location: Most of the actual attraction is between the lagoon and Fantasyland, but the entrance to the attraction is at the back of Tomorrowland between Innoventions and the lagoon. # of Ride Units: 124 cars, with up to 114 on the ride at one time. Ride Capacity: Each car can hold 1 adult or 1 adult and a child (2 adults would be very tight. Wait Times: The wait for this attraction can be very long (45 minutes or longer) and most of the queue is completely exposed to the sun. Use of FastPass is strongly recommended. Queue Description: The queue goes over and around the ride loading area and does not have much theming of its own. A large jumbotron-type monitor shows humorous scenes. Health Restriction: Should be safe for most conditions. People with back or neck problems should be aware of the risk of being bumped from behind by other drivers (strongly discouraged but it happens). Pregnant women should not ride. Ride Access: Most of the queue is wheelchair/ECV accessible. Use it until reaching the elevator to get down to the loading platform. Wheelchair Transfer: Wheelchair and ECV users will need to transfer into the cars. Driving the cars requires the ability to press the gas pedal and manipulate the steering wheel. Weight and Size Issues: Large and tall riders should ride alone and the cars will still be cramped. Height Restriction: Children must be at least 32" (82 cm.) tall to ride at all and 52" (132 cm.) to ride alone. Other Issues: Children under 52" (132 cm.) will be too short to push the gas pedal and operate the car. One adult and two small children can fit in a car. There is one safety belt to cover all the riders. Be very careful to not hit other cars on Autopia because the sharp jolt can hurt passengers in other cars. Be aware, other guests may hit you and your car may get jolted sharply. At this location: Autopia has been in this location since the park opened in 1955. 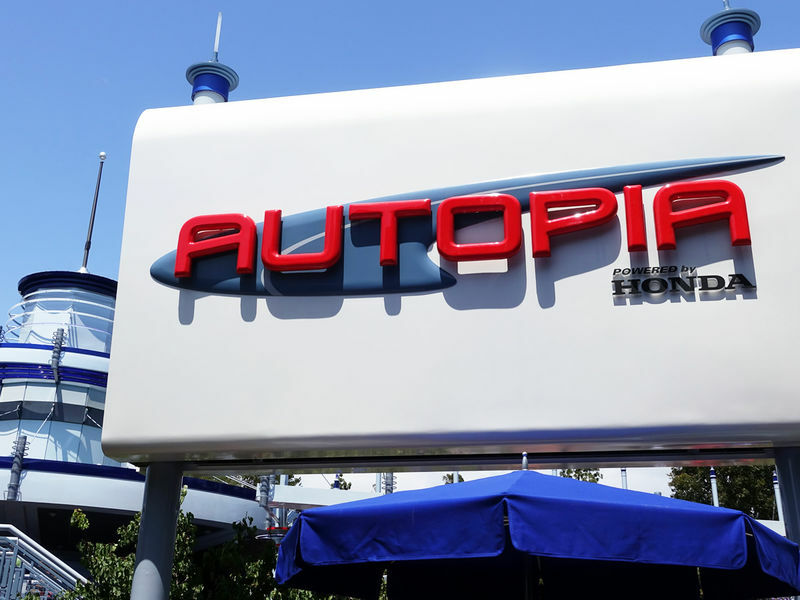 The Attraction's History: When Disneyland opened in 1955 there was just one Autopia, but that number quickly expanded to three with the addition of Junior Autopia (July 1956-December 1958) and Midget Autopia (April 1957-April 1966) allowing ever younger drivers to enjoy Autopia. In January 1959, Junior Autopia became Fantasyland Autopia and was essentially a second versoin of Tomorrowland's Autopia and served primarily to halve the long lines perpetually found at this attraction. Fantasyland Autopia lived on until November 1991 (spending it last eight months as Rescue Rangers Raceway). When Midget Autopia was closed in 1966, the cars were donated to Marceline, Missouri, the childhood home of Walt Disney, where they were installed in Walt Disney Municipal Park. It has been years since the cars were operated there, but hte track remains, along with a dedication plaque. The main Tomorrowland Autopia has chugged along through all of this change (including a change in track layout to make room for the Matterhorn Bobsleds). In 1999 the ride closed for a lenghty rehab and reopened in June 2000 with new cars, new theming, and a new sponsor in Chevron. Past Sponsor: Chevron was not the first sponsor of Autopia. Richfield Oil sponsored the attraction from 1955 to 1970 and the Richfield Drivers License that used to be given out at the attraction remains a cherished keepsake.